Suspect Charged With Attempted Murder in Beating of Store Clerk in Manchester, N.H. 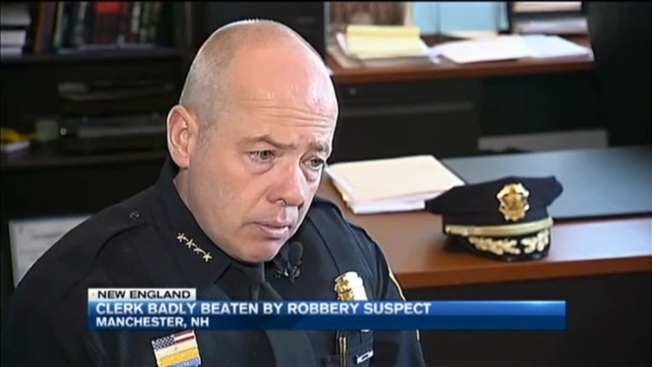 Clerk Badly Beaten by Robbery Suspect in Manchester, N.H.
A New Hampshire man is being held on attempted murder charges after allegedly beating a store clerk with a baseball bat in what the police chief is calling one of the most brutal attacks he's ever seen. Manchester Police Chief Nick Willard says the victim, who was brutally beaten inside 61 Best Market, has the "heart of a lion" fighting to survive for the eight long minutes he was being attacked, allegedly by Gedeon Karasi. "I am a hardened cop, I've done a lot on this job, and that's hard to watch," Willard said Thursday. "He's trying to kill him." Necn is only showing the beginning of the Feb. 21 surveillance video that purportedly shows Karasi beating the victim. "I say it's one of the most brutal attacks I have ever seen on video," Willard said. "The subject grabbed the bat and started swinging it viciously." Police say Karasi continued to beat the clerk with a baseball bat for nearly eight minutes. "This man is trying to kill the clerk," Willard thought as he watched the video. Police found the victim covered in blood on the floor of his store. "He could have died without a doubt," Willard said. He suffered a concussion, cuts, and bruises, and was released from the hospital the next day. That's when Willard went to visit him at his apartment. "I had to meet him and tell him that I was proud of him and that he was a courageous individual," Willard said. "It's the fighting spirit in him, I will forever admire this clerk." The chief says the uptick in corner store robberies over the past month is likely fueled by the drug epidemic. He admits some addicts need help, others need jail time. "There is a segment of those who are suffering addiction who are frankly dangerous individuals and they have to go to prison," Willard said. "And this man is one of them." Best Market store manager Umear Sheikh says his employee is slowly getting back to work. "We are like family," Sheikh said. "I thank God every day that he is OK."
Police say Karasi tried to run after the attack, but was quickly caught by one of their K9s. Karasi is charged with attempted murder and is being held on $750,000.